In April last year my life was changed forever by the birth of my daughter! So whilst I've been experiencing the highs and challenges of fatherhood, finding time to fish has become even more difficult. Time to blog about it has inevitably proved yet trickier to find! I have, however, sneaked in a short evening session most weeks since June and I've really enjoyed the fishing I've done this season. More than I have in quite some time! 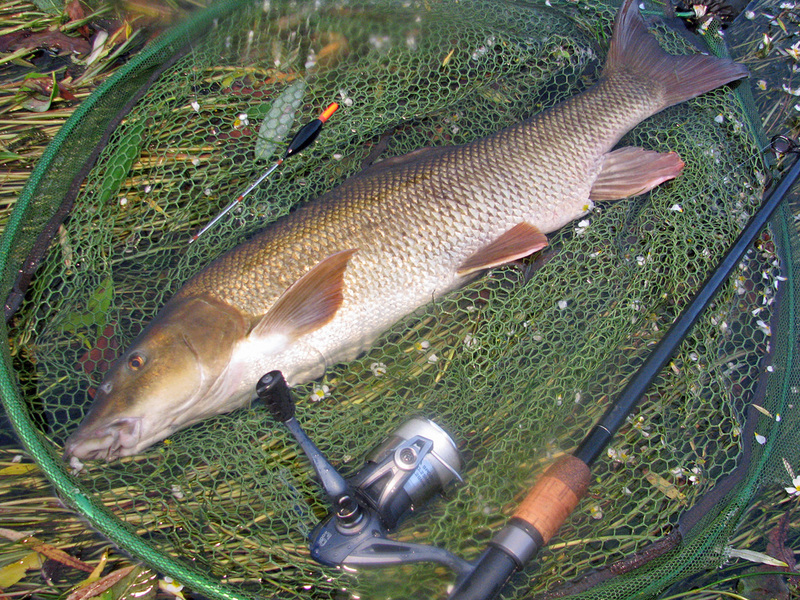 A couple of seasons ago I decided that I really wanted to catch a barbel on the float. With almost all of my barbel fishing consisting of summer & autumn evening sessions, I only managed 4 or 5 hours of trotting for them last season, with only a few small silver fish and minnows to show for my efforts. This year I decided to put some effort in at the beginning of the season when, arriving at the river between 7pm and 7.30, I would still have a good couple of hours of decent daylight available to me. 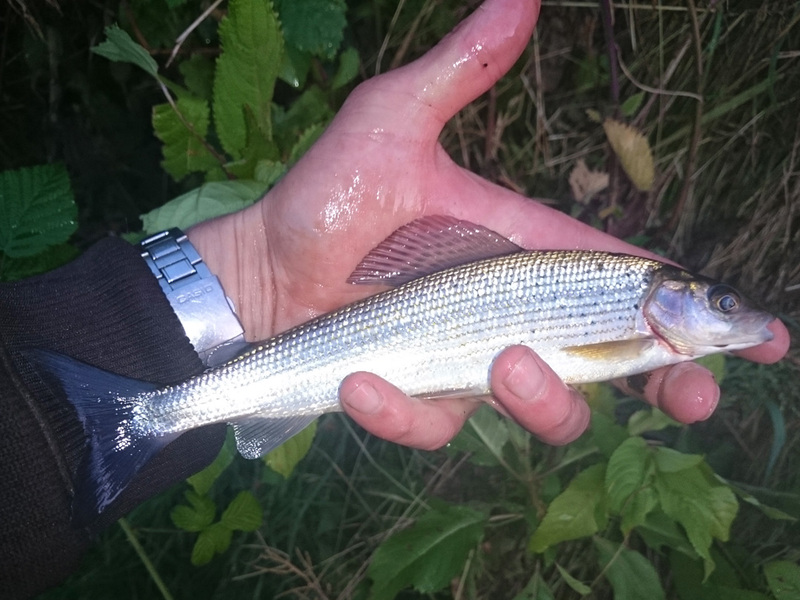 Although I was hoping for a barbel, so early on in the season I would be thankful to catch anything bigger than a minnow! 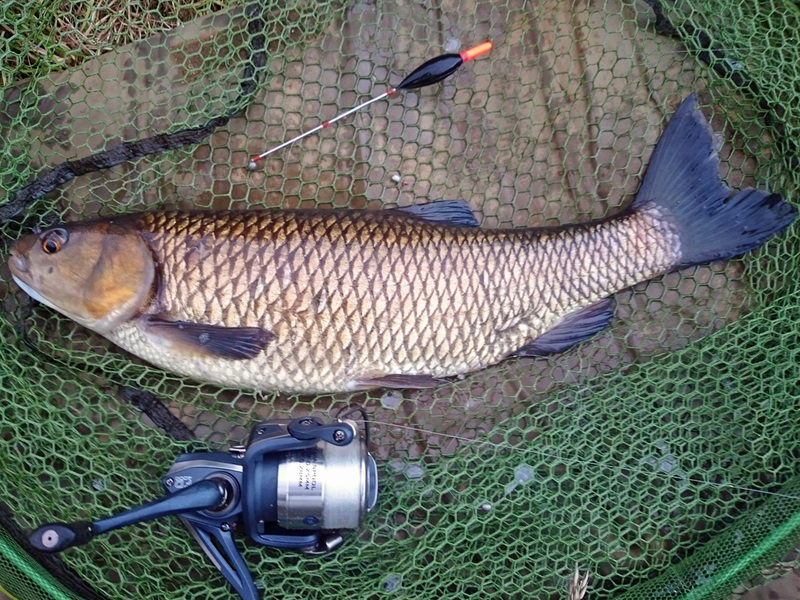 So, I got cracking from on my first session of the season, which was to the Derbyshire Derwent. I had a spot in mind with a good steady flow and depth of around 5 feet when the water is low, which it has been all season on the DD. My rig was pretty simple; 8lb mainline with a large, wire-stemmed Avon float through to a size 16 specimen hook on a 6lb hooklength. I started off using a bulk-shotting pattern, but I wasn't happy with how this was fishing so I soon moved to shotting in a shirt-button style. Last season I trotted maggots and was plagued by minnows but I also landed a few roach on legered pellets. Interested to see if the Derwent could produce a real specimen roach, I decided that feeding mixed-size pellets and then trotting a 6 or 8mm banded pellet should give me a decent chance of hooking barbel, chub, bream or even a decent roach. The first session went pretty well. I used my first few casts to learn the exact contours of the swim and after half an hour or so of steady feeding I had my first bite. The fish charged around the swim, convincing me that I'd hooked a small barbel or even a carp, but when it tired and neared the surface, the fish which appeared was a chub of around four pounds. A good fish on the float to kick-off the season with! After the chub I had no further action on the float, but spurred on by this success I went for similar tactics next session, but I put in a few casters, pellets and some hemp in with a baitdropper before I started. Within half an hour I was beginning to get bites on the banded pellet, which to begin with where from small roach and then a surprise grayling. This gave me a bit of confidence, but I was longing for a real tussle. Occasionally I flicked out the float slightly further upstream, giving the bait chance to settle near the bottom earlier in the trot. Near the beginning of one such trot through, the float buried and as I struck, something pulled hard in the opposite direction. A barbel was hooked and it soon dawned on me that all this time spent trying to tempt a barbel to take a float-fished bait was the easy part; now I had to try to control and land the thing! So began a couple of minutes of what I can only describe as enjoyable panic! I had a little chuckle to myself as I listened to the tinny 'pings' let out by the drag clicker on the aluminium spool as it spun and time seemed to stand still for a few seconds as I appreciated the way this barbel was pulling on the float gear. At the same time I knew full well that it was pulling straight towards a big bed of ranunculus! The fish made it to the weedbed but with some internal words of encouragement to calmmy decision making, a bit of gentle persuasion soon had the barbel out and back into open water. I was glad I hadn't gone for a lighter hooklength because this little episode would have been the end of my battle. Thankfully my hooklength - and my resolve - held out and a fit, chunky barbel of 8lb+ was in the net. 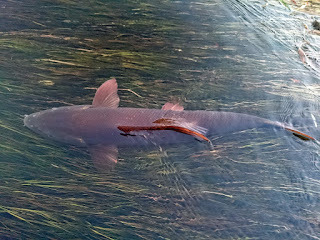 My first barbel hooked & landed on the float and a personal goal attained! With a large ranunculus patch just in front of me I waded out to rest the fish on top of it for a couple of trophy shots before returning it. A few minutes after I released this fish the light dropped sufficiently to make trotting impossible, but it held on just long enough for me to take my first grayling from this stretch. Not a big one at all, but what it lacked in size it made up for in greed, as it also took a 6mm pellet! One of the benefits of trotting during the last few hours of daylight is that - regardless of whether you catch on the float or not - the trickle of loosefeed going into the swim should draw fish in for if you want to fish static baits after dark. This is exactly what I intended to do, so as the float rod was put into the rod bag a couple of quivertip rods came out. A couple of biteless hours passed by, but I was confident that some barbel would show up at some point thanks to the bait that went in earlier. The water was low & clear and with the commotion caused by landing the earlier barbel, I suspected any others were making the most of the sanctuary offered by the streamer weed. I was using 1oz open-end swimfeeders with long hooklinks down to heavy-gauge size 14 hooks. To match what I'd been feeding earlier in the session, I fished with a cluster of mixed-size pellets on the hair which I then dunked in some Gloop from The Hookbait Company and finally dusted the whole lot with groundbait for maximum appeal. The tip on my upstream rod (cast just in front of the ranunculus bed which supported my earlier barbel for the photos) twitched promisingly a couple of times and my hand was on it in a flash. As it started to wrap around I lifted into a fish which plodded purposely around. We had a couple of stalemates and it took a few minutes before I could really get the better of it; conscious all the time of the volume of weed it could reach quickly in almost every direction! Finally I worked the fish upstream of where I was stood. By this point I'd realised it was a very decent fish I was attached to, which is why it was plodding steadily rather than charging around like the fish on the float had. As the fish surfaced I eased it towards the waiting landing net and it was mine! 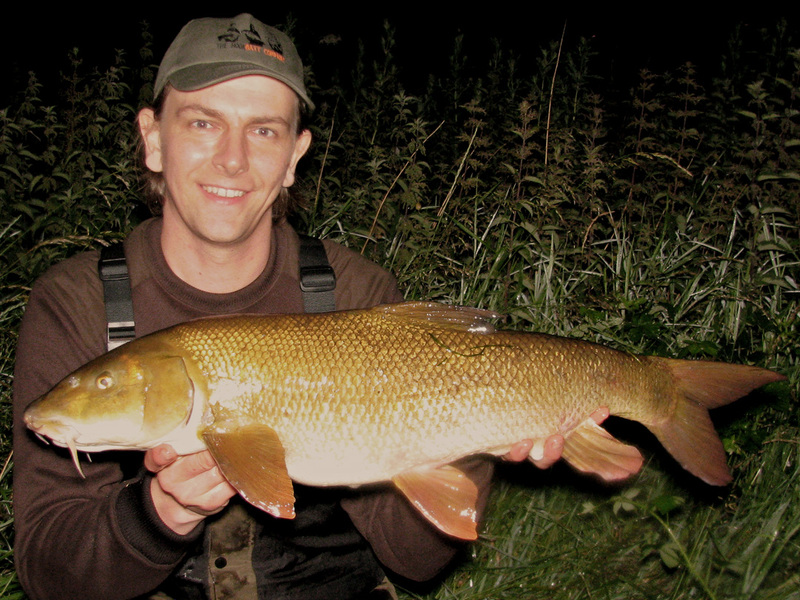 At exactly 12lb it ended up being my largest barbel of 2015 and came as a huge bonus to what had already been a productive and enjoyable evening.